For one brief moment it looked like the big finale of “Death Of Heaven” was going to be Danny Pink leading the Cybermen in a big synchronised song and dance number to the tune of “All You Need Is Love”. After all, we’d just seen Missy parachute in like Mary Poppins, and then learned that love is, indeed, all you need to overcome Cyber-conditioning (altogether now, “It’s eaaaaassssssyyyyyy!”), so it was wasn’t beyond all realms of possibility. Hell, if it was good enough for “The Prisoner”…? Danny becoming the champion of the world was a disappointingly glib end for what was for the most part a hugely entertaining episode. Less chilling than “Dark Water”, it instead aimed for a more Russell T Davies crowd-pleaser vibe, both in its ballsy I-can’t-believe-they’ve-actually-done-that spectacle (the dome of St Paul’s opening up like a giant metal flower, flying Cybermen, the Doctor sky-diving sansparachute to reach the TARDIS), outrageous concepts (Clara pretending to be the Doctor, the Doctor as president of the world) and sudden lip-trembling emotion (the Doctor’s moral dilemma over Danny’s situation, the goodbye – “Never trust a hug. It’s just a way to hide your face”). All of the above worked intensely well, especially the Doctor as President of Earth, which Moffat mined for all it was worth (“Remember all those years when all you wanted to do was rule the world? … Piece of cake.”). He also has great fun playing with idea of Clara as the Doctor, capitalising on the shock of the “Mistress” reveal last week to make it seem plausible (see also “Would You Credit It?” below). Moffat is on more Moffaty ground with the Cybermen-as-zombies parallels. Any excuse for a graveyard scene with Moffat (there were three in the space of four stories in series seven). Here the sight of Cybermen emerging from graves has a genuinely chilling effect, effectively captured by director Rachel (please only read my CV from 1996 onwards) Talalay. This is the kind of imagery that will stay with today’s nippers the way Autons crashing out of shop windows and tentacles hatching from alien seed pods did with their parents and grandparents. Possibly, though, the episode was less than the sum of its parts. There was so much going on that the changes in tone were occasionally a little too jarring, some elements (such as Danny returning the boy he shot to the land of the living) felt underdeveloped, and the Cybermen were underused (though their attack on the plane made up for that to some extent, and their guns are cool). Danny’s body was being stored at the Chaplet Funeral Home, which was presumably named after First Doctor companion, Dodo Chaplet. Maybe because Danny was dead as a dodo? Missy also felt a little wasted. Michelle Gomez is great at “bananas” and she relishes her self-consciously melodramatic dialogue but she seems to have problems dialling down the theatrics to give more intimate scenes a sense of threat. Her motives also seem muddled. If she wants to give the Doctor an army, why try to kill him by blowing up the plane (unless she wanted to see him regenerate into a woman?). And the Mary Poppins moment was unforgivably on-the-nose. It’s a shame, also, that there wasn’t a little bit more of an exploration of how becoming a woman might change the dynamic between the Doctor and the Master, but presumably that’s to come. Certainly an episode about Galifreyan sexual politics would be interesting. The major problem, though, is the whole “love conquers all” ending. It’s not only comes across as cheesy, it doesn’t even make an awful lot of sense. Admittedly there are precedents for Cyber-conditioning not working: Yvonne Hartman in “Doomsday” and Craig Owens in “Closing Time”. However, both those moments felt cheesy too. Here the Doctor claims that Danny is able to resist because “Love is not an emotion. Love is a promise,” which must rate as one of the most spurious get-out clauses ever. Because, yes, love is an emotion, and what’s more, a promise is a pact based on emotions – love, loyalty guilt, friendship or whatever. But it we do accept that Danny’s love is strong enough to overcome conditioning, then why not other people’s love as well? Is he the only Cyberman (with one exception; we’ll come to that) who’s left a loved one behind? Maybe we’re supposed to believe that Danny’s love is stronger than other people’s, but then the resolution comes down a massive coincidence – the Doctor’s companion just happens to have the single most useful boyfriend for a situation like this. Or maybe his inhibitor just happened to be the only one on the blink. Either way, unmotivated coincidences in drama are a cheap fix. Just when you think there’s the possibility that Danny didn’t press DELETE last week may have had some bearing (grasping at straws, yeah), what happens next makes that (and the faulty chip theory) impossible – the Cyber-Brigadier nonsense. Maybe we’re supposed to think the military mind combined with love is the killer combination, but in reality, the real key to Cyber-resistance seems to be “usefulness to the plot”. It’s a shame, because there’s so much clever scriptwriting going on display in “Death In Heaven” you feel you deserve a cleverer ending too. 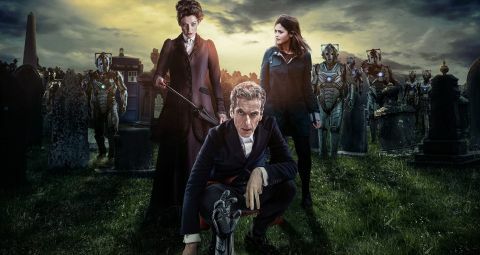 Series eight has been really strong and inventive in so many ways, but easy fix solutions have been a recurrent jinx (“Robot Of Sherwood”, “The Caretaker”, “Kill The Moon”, “Flatline” and “In The Forest Of The Night”). This doesn’t mean the show should be all about sci-fi technobabble with its denouements, but it would be great to have a few more resolutions where you’re just damned impressed at the Doctor’s ingenuity. Keep the big emotional moments, sure, just steer clear of “love as an energy” pseudo-science. Overall, though, “Death In Heaven” is an immensely enjoyable series finale, and – in best Doctor Who tradition – a rollicking spectacle the like of which you won’t see anywhere else on TV this week. Did you notice that Jenna Coleman’s name came up before Peter Capaldi’s in the opening titles, and her eyes appearing instead of Capaldi's – presumably as a red herring to reinforce her claim that she was the Doctor immediately beforehand? It was also a great way to mark her final episode (if indeed, it is her final episode). The Doctor says he will never salute (of course, later he does) but we already saw the Eleventh Doctor salute Kate in “The Power Of Three”. Considering Gallifrey is in another dimension, the Doctor gives up on looking for it very easily. Doctor Who series 8 aired on BBC One in the UK and BBC America in the US. The Master offers the Doctor an army of Cybermen.